Kissing babies is so passé. 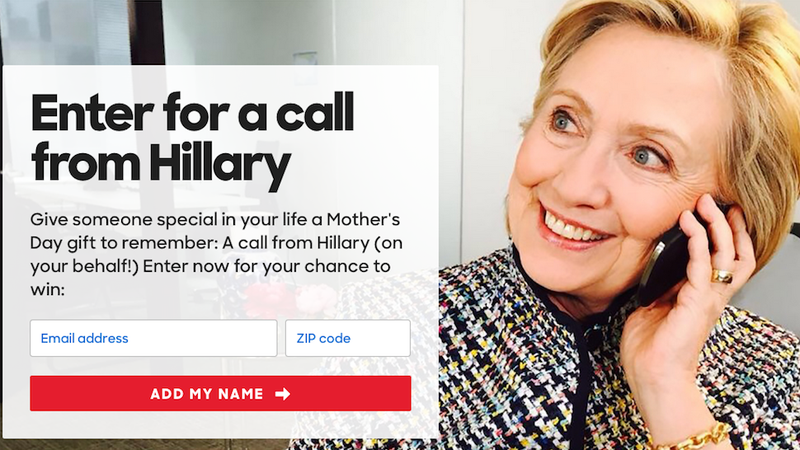 Hillary Clinton is taking the Political Stunt game up a notch by offering to call at least one lucky mom for Mother’s Day. Maybe even your mom. Here’s a free prank idea: enter your Republican mom who hates abortion, Obamacare, equal pay and the Clintons, in general in the drawing. If she wins, it’ll be amazing. Unfortunately, I can’t use this joke on my own mother; she’d probably tell everyone at church that “Hillary called the house!” so that’s a no go. But you, dear readers, can mine this gem, unless Clinton’s people realize its pranking potential. Just tell me how it goes, please? Image via Hillary Clinton’s campaign site.